In my first article in this series on training your dog to walk on a loose leash without pulling, I shared my unique four-step training process. In my second article I discussed the five most important reasons you should train your dog to walk on a loose leash. In this article I will share some of my students’ success stories. You’ll see that it’s possible to transform your dog’s walking behavior, no matter your circumstances. And by the end of the article you’ll be motivated to take action yourself. If others can do it, so can you. I would like you to meet two dogs, Balto and Makita, belonging to one of my students. 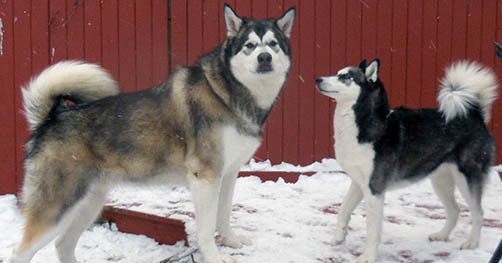 Balto and Makita are large dogs that weigh over one hundred pounds each. Their owner, Luann, was having a difficult time walking them together because they were easily distracted. But with the help of the self-control training games inside my Walk In Harmony Game Plan, Luann was able to teach her dogs to focus on her. 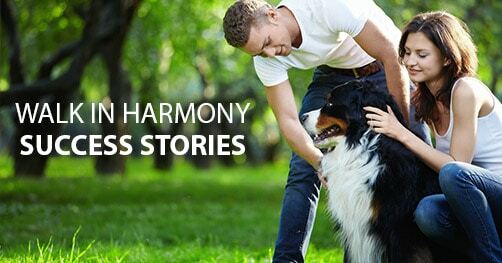 “Because of the Walk in Harmony Game Plan, I can finally walk both of my dogs at the same time and go to parks, beaches and even hiking with them. I have a 3 year old small Siberian Husky and 7 month old 100 pound Alaskan Malamute and they both are natural pullers when walking on a leash. I had to take them on walks separately because of the pulling and being distracted so I only took them one at a time up and down my block. After using this program on both dogs I can now take them on walks together and go to parks and beaches, hiking and anywhere I want. Building your dog’s self-control is vital. It will teach your dog to think twice before running after something like a squirrel or another dog. And the best thing is that you can start building your dog’s self-control in only five minutes and in the comfort of your own home. For example, my popcorn training game teaches your dog to ignore a pile of popcorn on the ground. Although you’re not likely to see this while walking your dog, the purpose of the training game is to build your dog’s tolerance for distractions by focusing on you instead of the distraction. 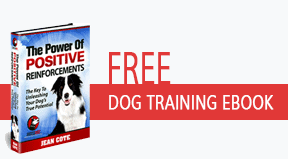 The game serves as a blueprint you can use to train your dog to overcome any distractions including a dog barking, a squirrel running, or something on the ground. Meet another student who has gone through my Walk In Harmony Game Plan: Lisa also struggled because her dog Doodle was easily distracted. But her dog reacted differently than Luann’s. Instead of just pulling on the leash, Lisa’s dog would also become overly excited and bark uncontrollably at the distractions. Lisa found herself in a quandary: How could she get her dog to stop barking? If you’re wondering what Lisa means by “It’s Your Choice,” it’s the process of teaching your dog that it has a choice. Instead of punishing your dog for bad behaviors like pulling on the leash or barking, I teach my students to offer their dogs a choice. If their dog makes the right choice, such as paying attention to them, walking next to them, or ignoring distractions, then they reward it. This is the opposite of what many traditional dog trainers teach. Many dog trainers will have you punish your dog for bad behaviors by either pulling sharply on the leash or using a pain-inflicting device like a choke or prong collar. There’s none of that in my program. Instead, my program requires you to think creatively and to understand what goes on in your dog’s mind. As you offer your dog choices, your dog will learn to think about what it’s doing, and over time your dog will learn to look for ways to please you, even when you’re not actively asking it to do anything. That is how I teach my students to train their dogs, and that ultimately leads to the happy, well-behaved family dog they’re proud of. Now I’d like you to meet Chester, another dog that has gone through my Walk In Harmony Game Plan with her owner Marianne. 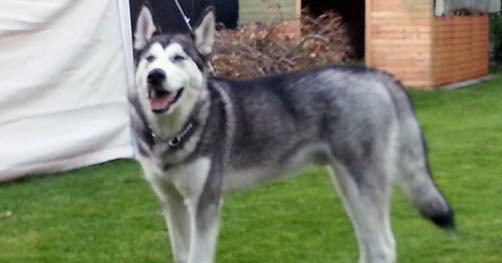 Marianne knows a thing or two about dogs and is very experienced with owning different breeds. 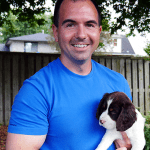 But before she enrolled in my program she had trained her dogs using the traditional methods I mentioned above that are focused on punishments instead of rewards. But Marianne was looking for a better way to train her dog to walk on a loose leash. She wanted her dog to pay attention to her, to walk at the same pace with her, and to respond to her body language. “Jean Cote’s Walk In Harmony Game Plan was certainly one of the BEST investments I have paid for – no classes, no fuel costs and no ‘waiting’ around to ‘do my turn’! I will be honest and say that her letter left me a little teary-eyed. There’s nothing better than making a difference in my students’ lives and seeing how much their relationships with their dogs blossom as a result of my training methods. That is why I’m so passionate about this subject. It’s not just about training your dog to walk on a loose leash or to stop pulling. My ultimate goal is to give my students the tools and strategies to train their dogs to do anything they want them to do. I believe the more time you spend interacting, training, and having fun with your dog, the less likely you are to give up your dog. There’s a crazy statistic from the ASPCA that 3.9 million dogs in the United States are abandoned to shelters every year. And of that number, 30 percent will be euthanized. That is a staggering statistic, and it’s only for the United States. And so it’s my duty as a professional dog trainer to promote these training methods because I know how much they can improve the quality of life for both owners and their dogs. I would like to thank you for reading this three-part series, and if you would like to continue your education I would be pleased to welcome you inside my “Walk In Harmony Game Plan.” I’m always excited to meet and greet new students, and I look forward to reading your success story. What s great series on getting my dog to be a better walking partner. She is still a work in progress but we see improvements every day. Thanks Jean.